This dish can be prepared and cooked the day before. Just reheat the cauliflower for 20 minutes in the oven at 160°C/gas mark 3. Remove the leaves and outer ribs from the cauliflower. 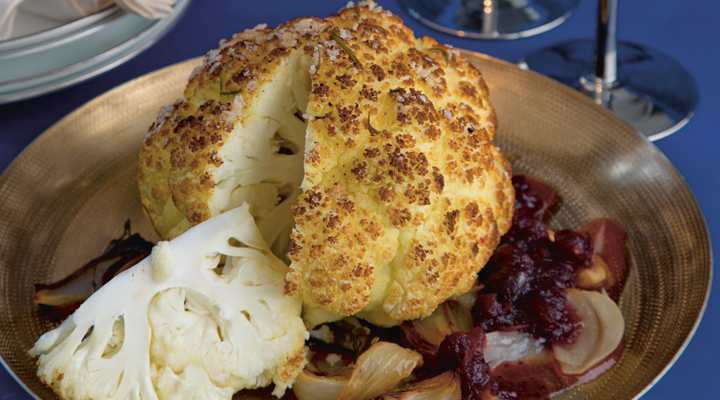 Scatter the onion and garlic in a baking dish and put the cauliflower on top. Drizzle over the olive oil and sprinkle with the thyme, rosemary and some salt and pepper. Bake in the oven for 50 minutes, until the cauliflower is tender when pierced with a knife and golden brown on the surface. Remove from the oven and transfer to a serving dish. Serve with the cranberry sauce and garnish with fresh coriander if liked.